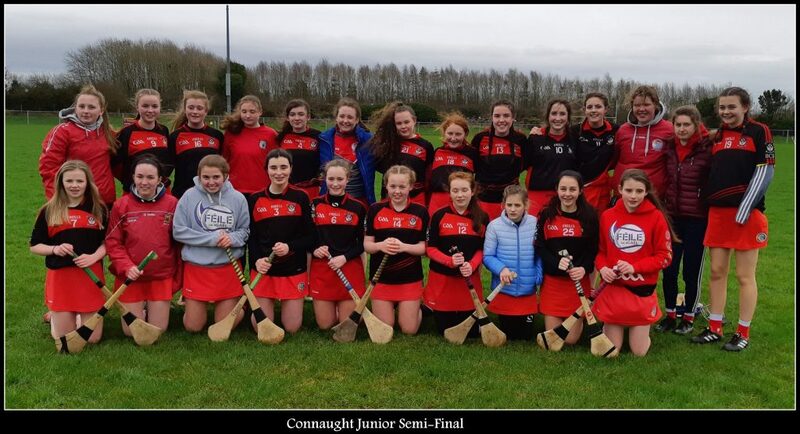 Ballyhaunis CS took on a fancied Roscommon CBS side today in the Connaught Junior Camogie semi-final. Roscommon, having won home venue, (via a toss of coin) chose Lisnamult as the venue. In what was a bitterly cold morning the sliotar was thrown in at 11 after a minutes silence held in memory of our dear friend Anne Grogan. The initial encounters saw Ballyhaunis, with a strong wind behinf their backs, winning all the tight battles and converting most of their chances. At half time Ballyhaunis had built a strong lead of 3:06 to no score. The second half proved very different and with some adjustments and a strong breeze Roscommon were much more competitive. However in the end the BCS stood strong and ran out deserving winners by a final score of 6:08 – 3:02. We will now face the winners of the second semi-final which is being played tomorrow between Ballinasloe and Athenry. Despite a long gap since the last game the girls today proved that they will be a match for any team and have a great chance to capture Connaught glory. Well done to all involved.